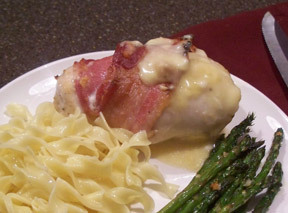 When it comes to chicken recipes, this one ranks near the top. 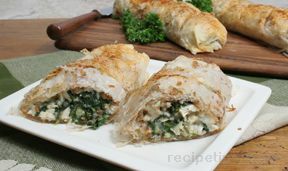 Flaky phyllo dough rollups are stuffed with a mixture of chopped chicken, onions, spinach, and cheeses and baked until golden brown. These chicken strudels make an excellent brunch or supper entrÃ©e. In a skillet, bring 2 cups of water to simmer with 1/2 onion, bay leaf and salt added. 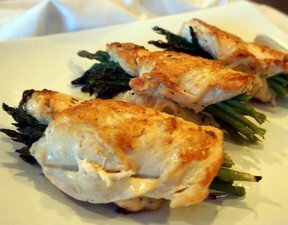 Add two chicken breasts, cover and simmer for 20-30 minutes or just until the chicken is tender. Remove from the water and allow to cool then chop into cubes. Meanwhile, in a medium skillet, sautÃ© the onion in olive oil until tender, approximately 10 minutes. Add spinach and continue to cook for 5 minutes, stirring frequently. Remove from the heat and place in a medium bowl to cool. Stir in the cheeses, stock, egg, salt and pepper. On waxed paper, place one sheet of phyllo, brush with melted butter and sprinkle with 1 tablespoon of bread crumbs. Repeat with 4 or 5 more layers of phyllo on top of the first one. Spoon one cup of chicken mixture on one end of the layers of phyllo. Roll up and tuck the ends under slightly. Brush the tops with butter and place on a baking sheet. Cut diagonal cuts across the top approximately one inch apart and 1/2 inch deep. Repeat this process with the rest of the chicken mixture and phyllo making 5 strudels. Bake for 20 minutes, slice and serve warm.